Contains 30% real insects and 50% realfruit! 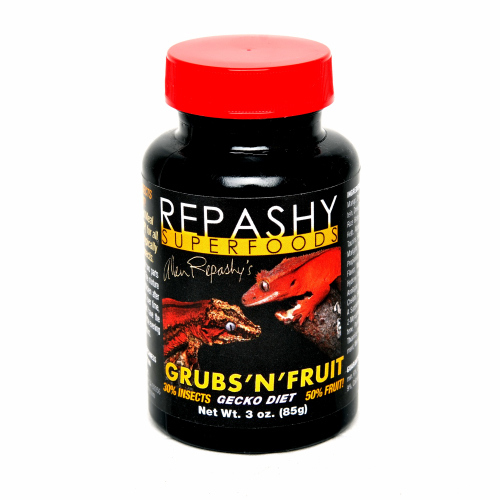 Our Insect Protein-Based Meal ReplacementPowder (MRP) for all Fruit-Eating species that typically eat a diet of Fruitand Insects. INGREDIENTS: Black Soldier Fly Larvae Meal, Dried Banana, Dried Date, DriedMango, Coconut Meal, Pea Protein, Rice Protein, Stabilized Rice Bran, GroundFlaxseed, Cane Molasses, Lecithin, Algae Meal, Calcium Carbonate, DicalciumPhosphate, Taurine, Dried Kelp, Dried Watermelon, Rose Hips, Hibiscus Flower,Marigold Flower, Paprika, Turmeric, Citric Acid, Salt, Calcium Propionate andPotassium Sorbate (as preservatives), Natural Flavor, Magnesium Amino AcidChelate, Zinc Methionine Hydroxy Analogue Chelate, Manganese Methionine HydroxyAnalogue Chelate, Copper Methionine Hydroxy Analogue Chelate. Vitamins:(Vitamin A Supplement, Vitamin D3 Supplement, CalciumL-Ascorbyl-2-Monophosphate, Vitamin E Supplement, Niacin, Beta Carotene,Pantothenic Acid, Riboflavin, Pyridoxine Hydrochloride, Thiamine Mononitrate,Folic Acid, Biotin, Vitamin B-12 Supplement, Menadione Sodium BisulfiteComplex). Guaranteed Analysis: Crude Protein min. 24%, Crude Fat min. 6%, Crude Fiber max. 5%,Moisture max. 8%, Ash max. 9%, Calcium min. 1.2%. DIRECTIONS: Mix one part MRP with two partswater by volume as a starting point. The mixture may appear watery at first,but will thicken after several minutes. If separation occurs over time, useless water. As fed, MRP should have the consistency of ketchup. Feed geckos inthe evening and remove uneaten MRP within 24 hours.